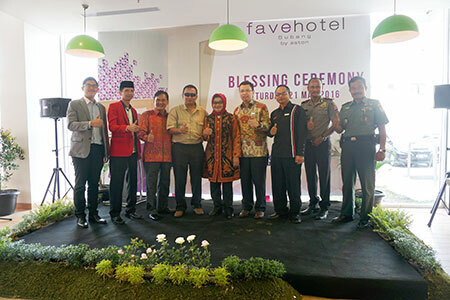 Subang, May 24th 2016 - Archipelago International is maintaining its reputation as Indonesia’s fastest growing hotel management group with the latest opening of the brand new favehotel in Subang, West Java.favehotel Subang is built in the center of the regency with easy access to the Subang Toll Gate, just 20 minutes from Pegaden Baru Train Station, and only 10 minutes from Subang Bus Terminal. Currently the tallest building in Subang, favehotel Subang offers prime views of the region's calming, green surroundings; a sanctuary in the heart of the city for holidaymakers and weekend breakers alike. Further drawing tourists to this up and coming destination, nearby attractions include Gunung Tangkuban Perahu, Kolam Renang Ciheuleut, Desa Wisata Sari Bunihayu and Penangkaran Buaya Blanakan, as well as the musical and traditional ceremonies that can only be found in Subang. favehotel Subang boasts 108 fully-furnished guest rooms suitable for both short and long stay guests. Each room comes with super comfortable twin or double beds with 100% cotton bed sheets and duvets, matched with exclusive mountain or garden views from the windows. The rooms also feature 32” LED TVs with international and local channels, and throughout the hotel guests can make use of the super-fast Wi-Fi to ensure everyone remains connected. Subang Regency is rich in natural resources such as oil, gas, and minerals, and as such this destination is rapidly becoming a new business hub of West Java. Suitably so, favehotel Subang not only caters to leisure travelers in the area, but is also designed as the perfect space for business travelers looking for a calming and natural ambience. favehotel Subang features 3 meeting rooms capable of accommodating up to 176 guests, together with the favehotel Lime Coffee Shop and signature Restaurant that serves Korean, Italian, and traditional Subang delicacies and doubles as an alternative venue for a casual business discussion or client lunch. “Continuing our commitment to bringing only the best quality services and facilities to our hotels, favehotel Subang is set to become the first internationally managed budget hotel with comprehensive facilities in the area. We are confident that favehotel Subang will be the first choice for both business and leisure travelers when visiting this burgeoning destination,” said Lukas Samali, VP of Human Resources Archipelago International.